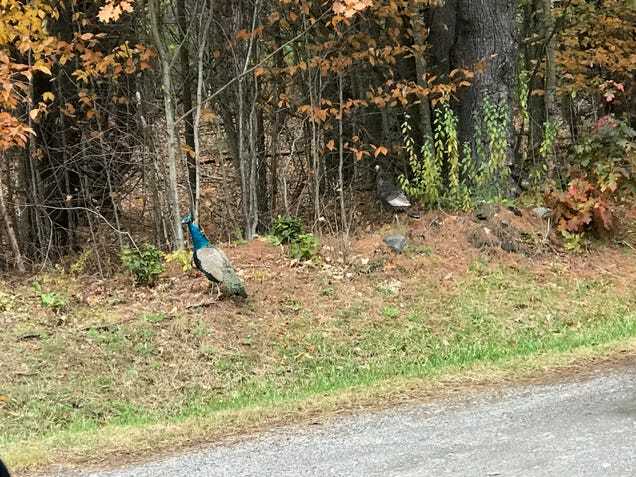 A pet peacock that’s evaded capture for weeks in Vermont, U.S. has reportedly ditched his human family for a group of wild turkeys. The owner of the bird, whose name is Pea, said that the peacock was still on the lam as of Saturday. My peacock has run off with the turkeys. Do you have any suggestions on how to catch the little twerp?? I do not believe they can breed……concerned. I know where he is most days. Any information would be appreciated! That person turns out to be Vermont resident Rene Johnson. Reached by email on Saturday, Johnson told Gizmodo she contacted the agency as a last-ditch effort after temperatures began to drop and she worried about the bird in freezing temperatures. Johnson said that the peacock ran off out of loneliness after the death of his bird buddy, and that chickens on their property made for poor company. Pea spotted in the wild with a friend. The issue with retrieving Pea seems to be less about locating the peacock and more about trapping it. Johnson said she’s received reports of Pea’s whereabouts, but she hasn’t been able to catch him. Despite a brief reunion, Johnson said that Pea doesn’t like to be touched and again got away. Even when he was home, she said, he was difficult to catch “unless he went into the chicken coop so we could shut the door.” Pea was free range prior to his escape, though Johnson and her husband had planned to erect a large enclosure. She said she’s now working with a neighbour to set a trap. Pea’s great turkey adventure is a relatable one. After all, aren’t we all just looking for love and belonging in this life?